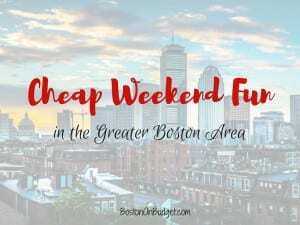 Cheap Weekend Fun in Boston for March 16-17, 2019! St. Patrick’s Day Parade: Sunday, March 17, 2019 in South Boston. Enjoy this annual Parade kicking off at 1PM at Broadway Station. St. Patrick’s Day at South Street Diner: March 13-17, 2019 at the South Street Diner. Celebrate St. Patrick’s Day all week with Corned Beef & Cabbage special with Irish Bread and a pint of Guinness for $10! Maple Syrup Boil Down: Saturday, March 16, 2019 at South Street Farm in Somerville. Enjoy this annual Maple Syrup Boil Down with maple tapping, syrup tasting, live music, and more. 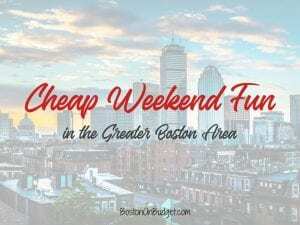 Cheap Weekend Fun in Boston for August 25-26, 2018! I really can’t believe this is the LAST WEEKEND OF AUGUST! WHAT!??! Well, if you are looking for some fun and cheap things to do for the last weekend in August, here’s some ideas! As always, please let me know in the comments below if I missed any fun and free events in Boston! Saint Anthony’s Feast: August 23-26, 2018. Head to the North End of the 99th Annual Saint Anthony’s Feast this weekend. Movies at the Lawn: Saturday, August 25, 2018 at The Lawn on D. Enjoy a free movie screening of The Sandlot at The Lawn on D at 8PM, fun starts at 6:30PM. Films at the Gate: August 24-26, 2018 at the Chinatown Gate. Enjoy a series of Kung Fu movies and other films next to the Chinatown Gate this weekend. African Festival of Boston: August 26, 2018 at Boston Common. Enjoy this multi-cultural celebration featuring the best of African arts and culture. Magic 106.7 Family Film Festival: Every Saturday from July 7-August 25, 2018 starting at 6PM. Enjoy a free movie under the stars in the courtyard of the Prudential Center with a free screening of A Wrinkle in Time starting at dusk. Movies in the Park: Every Saturday from July 7-August 25, 2018 at Sylvester Baxter Park in Somerville. Head to Assembly Row for a free outdoor movie with a free screening of Thor: Ragnarok starting at dusk. Sunday Night Movie Night: Every Sunday night from July 22-August 26, 2018 at Christopher Columbus Park in the North End. Enjoy a free outdoor movie screening of Finding Dory at dusk. 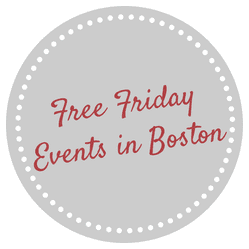 Free Friday Events in Boston for August 17, 2018! Fisherman’s Feast: Head to the North End on Friday and through the weekend for this annual North End Feast! Free Friday Events in Boston for July 20, 2018! Revere Beach Sand Sculpting Festival: July 20-22, 2018 at Revere Beach. Head to Revere Beach for this annual sand sculpting festival!